Need Something other than a standard invoice Book? Our NCR books are completely customisable. They can be in any format and include any information you wish. Don’t see what you are looking for? Have a complex setup or special requests? Our free print consultation is open to everyone. Contact us today, we’d be happy to help! Don’t have a design for your NCR book? Utilise our free layout services to make the process easy and seamless. FREE PANTONE. 1 colour and 2 colour prints include Pantone ink mixing. Use your brand colours at no extra charge. Inkable’s Custom Invoice Books are printed on quality 45gsm NCR paper stock. Original records are printed on White 45gsm paper, and copies are printed on 45gsm Yellow, Blue, Green, or Pink colour paper. For books with terms and conditions on the back we use thicker 70gsm stock on the original so the text won’t bleed through to the opposite side of the page. If you desire thicker stock you cant make a custom quote requst. Depending on your artwork, you can opt for single colour printing, two colour printing, three colour printing, or full colour invoice book printing. The individual records in each book are gummed staple bound at the head. Pad Format comes with a soft front cover (brown 45gsm protective sheet on top), while Book Format comes with a cardstock front cover (options for Brown Kraft Uncoated or Matte White Coated), with page dividers, numbered and perforated for easy tearing. Every pad or book has a 300gsm chipboard back cover that can be slid to the back so that the book is easy to keep open while writing. *LEADTIMES: Please allow 8-12 working days for production, finishing, and shipping. This applies from the time you approve the artwork and final payment. Please allow extra production time for custom PMS inks and full colour projects. CUSTOM SIZES AND SPECIAL STOCKS: We can produce any size up A3 and sizes smaller than A6 however custom sizes are not available through our online system. Please use our custom order form. Check that the document size fits our listed specifications. NOTE: If you are unsure, please use our provided templates. For more templates options please go to the specific product page to download. 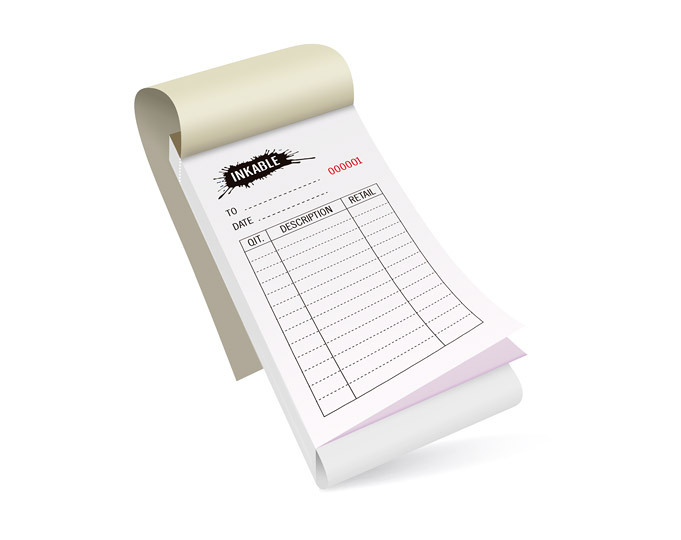 Invoice Books and Invoice Pads are essential business marketing tools that you need in your day-to-day operations. Each sale starts with a simple inquiry—professional Invoice Books provide your customers with complete and correct pricing and terms—and completed quote forms afford you with a list of leads that you can convert into loyal customers. NCR is convenient as each effort is duplicated to suit your specific departmental needs. Copies are instant references for future customers and suppliers, creating a log for sending statements, and an organised cache of detailed information to catalogue your small business’ performance. Documenting sales, credits, refunds, expenses, and customers’ receivables is not only something that fulfills certain accounting required by law, it also protects small businesses as it ensures that insurance claims, lost property claims, credit/debit records are dealt with fairly and accordingly. MAKE SURE YOUR LAYOUT SUPPORTS ALL THE NECESSARY INFORMATION IN YOUR INVOICE BOOKS OR INVOICE PADS. Are these for standard and fixed quotes for customers to take home and review? Or are these for very specific jobs that require different specs and diagrams, with special pricing attached to terms and conditions? Make sure your layout supports all the information that you and the user of your invoice records will need. 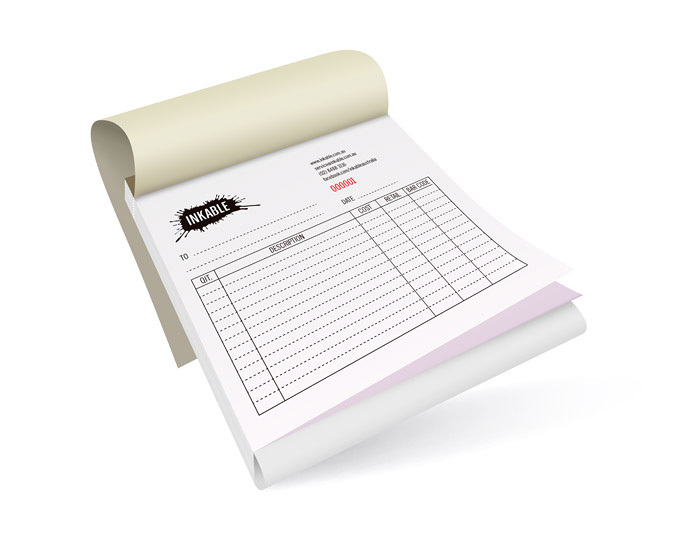 HAVE INVOICE BOOKS OR INVOICE PADS BOUND ON THE SHORT EDGE IF YOU ARE AFTER A MORE ECONOMICAL OPTION. If you envision that your Invoice Books or Invoice Pads are going to need only minimal information written on them, opt for binding on the short edge to streamline the compact design, and save on production costs. KEEP A LIST OF CUSTOMERS WHO HAVEN’T CALLED BACK. Invoice Books are not only pricing records—they are your comprehensive list of prospective customers. By separating standard quotes and volume orders and keeping coded copies that can be referenced to by your sales department, you can have scheduled follow ups to engage latent customers. There is heaps of potential for your sales to increase if you use Invoice Books as a marketing and sales tool. SAVE ON PRINTING COSTS. Envision how these forms will be used. Do you simply need clean columns, or more space for notes? Once you have made clear what your Invoice Books are for, it will be much easier for you to decide on what orientation it should be printed in, and how big or small the forms are to accommodate required information. BRANDING IS IMPORTANT. As Invoice Books are usually printed in solely Black ink, your company logo will be reproduced using a single colour with halftone gradients. If the recipient is your customer, it could be important to you that your logo is printed in full colour as receipts are also branding materials. However for internal use this might not be the case. To save on printing, make branding as simple as possible for internal use, and add taglines or necessary contact information if you are going to use this for customer receipts. Always think about the person who will be receiving a copy, and plan out what information will be helpful to them. (check mark) At Inkable our big benefit is that you can specify Pantone colours (PMS) apart from standard coloured inks. Contact us if you would like specific colours for your custom Invoice Books.